"When we look into a mirror, we think the image that confronts us is accurate. But move a millimeter, and the image changes. We are actually looking at a never-ending range of reflections. But sometimes a writer has to smash the mirror, for it is on the other side of that mirror that the truth stares at us. If such a determination is not embodied in our political vision, we have no hope of restoring what is so nearly lost to us: the dignity of man." The invasion of Iraq was a bandit act, an act of blatant state terrorism, demonstrating absolute contempt for the concept of international law. We have brought torture, cluster bombs, depleted uranium, innumerable acts of random murder, misery, degradation and death to the Iraqi people and call it "bringing freedom and democracy to the Middle East." Democracy Now in their broadcast of 30th and 31st December played a remarkable speech of Harold Pinter. The last part of his speech is nothing short of the most telling truth about the hypocrisy of world powers and tremendous injustice. Harold Pinter gave the speech in December of 2005. [>] Watch and Listen to this extra-ordinary speech here. About: Harold Pinter, the Nobel Prize-winning British playwright, screenwriter, poet, actor, political activist, died at the Christmas eve of December 2008, at the age of seventy-eight after a prolonged battle with cancer. Blessed be his soul. He’s considered one of the most influential and provocative dramatists of his generation, often compared to his friend and mentor, Samuel Beckett. 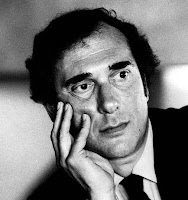 Born in 1930 into a Jewish family in London that had fled persecution in Poland and Odessa, Pinter began his career as a stage actor and wrote his first play, The Room, in 1957. Pinter was also well known as a vociferous critic of British and American foreign policy and an activist against nuclear proliferation, political repression and censorship. As early as 1948, Harold Pinter resisted joining the British military national service and registered as a conscientious objector.
. 1st part of his speech can be watched and listened here.